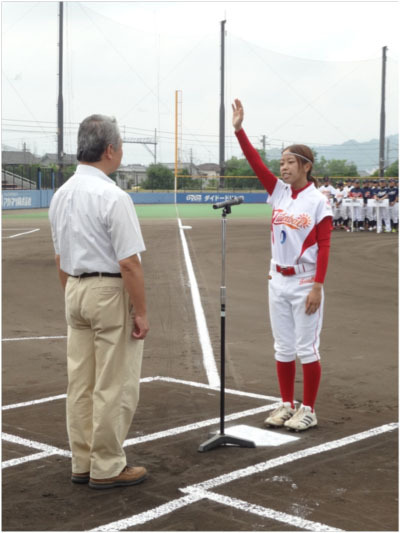 Tokihiro Nakamura, Governor of Ehime Prefecture, opened the 9th Japanese Women’s Baseball Championship by throwing the ceremonial first pitch at the Madonna Stadium in Matsuyama City on Saturday, August 3rd, 2013 morning. The record 36 teams throughout Japan, including 7 newcomers, will play round robin in 12 groups of 3 teams each, and the 12 winners from each group will compete in knockout competition. Shobi Gakuen University Team (Saitama Prefecture) boasts an array of international players including right-handed junk baller, Isozaki, who was chosen MVP of the last Women’s World Cup, and aims for unprecedented 3 consecutive wins of the Championship. Team Samurai (Saitama), Silver Medal for the last Championship, with the star infielder Rokkaku, Fukuchiyama Seibi Team (Kyoto), Bronze, and Heisei International University (Saitama) with right-hander Singu, aspire to the top ranks of the Championship.